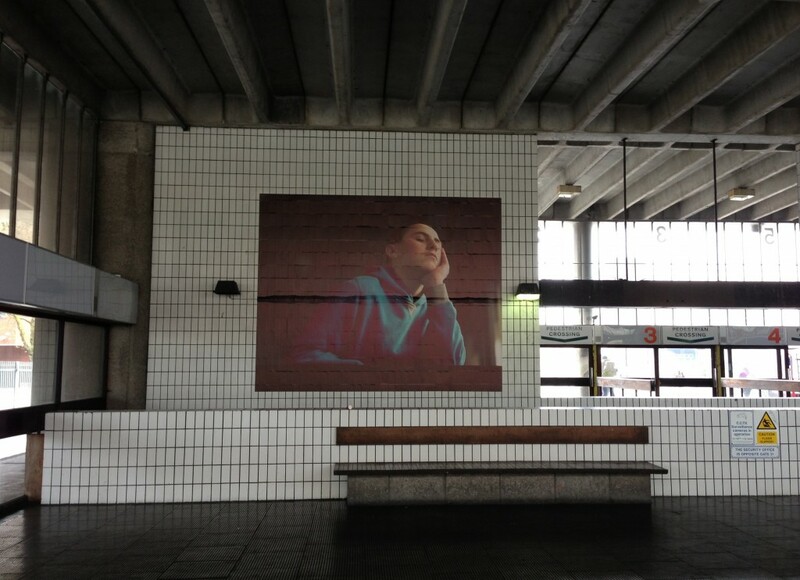 Photograph by Jamie Hawksworth of people in the Bus Station printed onto vinyl and displayed directly onto the tiled interior of the building. Photograph: Sally Stone. The living conditions of First Nations communities, food-security concerns, access to clean safe water, domestic violence – seemingly disparate subjects can be, and are being, connected to interior design teaching and practice. Such issues are particularly linked to the ongoing discussions of designers working within the new global design paradigm. There is evidence that a range of worthwhile initiatives have been undertaken by design professionals who choose to pursue socially responsible practices, and by educators and practitioners who are intentionally shifting away from a focus on pure aesthetics and market-driven practices. Design activism is a combined entity of aesthetics and ethics. It is trans-disciplinary, it incorporates mixed media, and it is inspired by the ethics of socio-political activism and community building. Several design activists have partnered with the design profession and specific political agencies to create design solutions that meet the needs of politically, economically, and socially disadvantaged communities, but initiatives are sporadic. In order to make what are now essentially grassroots initiatives a part of the mainstream, models and methodologies for action need to be developed within the design academy. As guest editor, this call is shaped by my desire to make ethics a more central component of interior design practice and pedagogy. This journal’s theme calls for a re-thinking of interior design pedagogy and a review of current practices found in design activism. For instance, the author(s), could consider and highlight noteworthy projects of scholars whose pedagogy and critical work is linked with activism, and/or respond to pedagogical shifts found in the field of design activism, particularly as they emerge in and relate to the discipline of interior design/interior architecture. The goals of this call are two-fold: to promote debate, discussion and theorization among designers, design academics and various segments of the general public about the place of ethics and activism in design, and to contribute to the development of knowledge that focuses on embedding design activism into the design curriculum and design profession. The overall objective of the call is to encourage a shift towards activism in interior design theory and design education. Lorella Di Cintio, PhD, is a faculty member in the School of Interior Design at Ryerson University. She has been educated in Canada, United States, and Europe in the fields of Interior Design, Architecture, and Philosophy. Her research focuses primarily on design activism and social responsibility and she is the founder of The Design Change = Exchange Initiative. She is affiliated with the Centre for Studies in Food Security and EDGE lab at Ryerson University. Her area of research focuses on the social and political positions undertaken by designers. Current projects explore and employ various design strategies in the areas of design activism, cross-cultural collaborative design learning, civic engagement and participation, food security activism and human-centred design models. Di Cintio is a dedicated and respected advocate for equity, inclusion and social justice at Ryerson and beyond. She has forged working partnerships with First Nations communities in Canada and Mexico, and her students’ designs have supported Toronto food-bank users, Haitian earthquake survivors, and others. Di Cintio creates unique pedagogical links among design, service learning, and such complex issues as socioeconomic status and food security. She works to develop curriculum that transforms theory into practice. She has received a silver medal for design education and service from the Universidad Iberoamericana, and represented Ryerson on a design mission to China. Several of Professor Di Cintio’s appointments and accolades, both academically and within the profession, have been “first precedents” for the School of Interior Design. She is an academic reviewer for the Journal of Interior Design with a focus on service-learning pedagogy, and she was recently awarded the position of Editor-in-Charge of Service Activities in Academia with the Interior Design Educators Council (a North American organization). Lorella Di Cintio is increasingly recognized as a leader in the teaching of design activism and the pursuit of design with a conscience.